Ever since we got back from London, I’ve been obsessed with tea. Here’s the thing, I used to hate tea. I think the tea’s I’ve had are just really watered down and flavorless. I like bold flavors. Like I like darker roasts for coffees and I think with tea, I like black teas. Now, I never really knew this because my parents always had green tea or white teas so I never had the opportunity to try black tea. I just assumed all teas were the same watered down flavor. Every time I’ve been offered tea, I just politely decline. Well, afternoon tea in London is with black tea and with milk. Jason said it best: sometimes, it just takes trying something where it’s a common thing in their culture for you to appreciate it. Now every time you drink tea, it’ll remind you of our time in London. I’m a huge fan of chocolate and coconut so putting those flavors together is like a perfect match, in my opinion! I recently grabbed some chocolate coconut granola bars at Costco and they’re such a good snack to have mid-day or before I go to barre class. I figured I’d make chocolate coconut granola so I could put it in my greek yogurt in the mornings or even eat it as cereal. It’s so freaking good!! I could eat this every morning with my cup of coffee or vanilla greek yogurt. 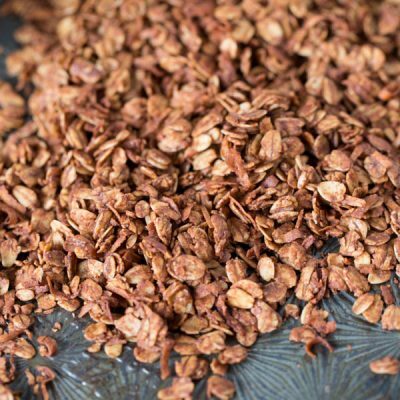 If you love the chocolate coconut combination, you’ll definitely fall in love with this granola flavor! The perfect topping for your morning yogurt! Preheat oven to 300 degrees Fahrenheit and line a baking sheet with parchment paper or silicone baking mat. In a small microwave-safe bowl, heat coconut oil and maple syrup together for 30 seconds. Whisk in coconut extract, vanilla bean paste, cocoa powder, and salt. In a large bowl, place the rolled oats and coconut flakes in. Pour the liquid over the oats and coconut. Stir to coat completely. 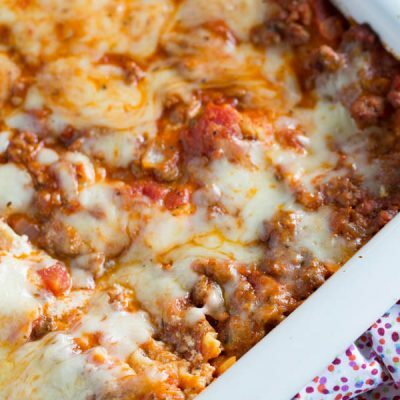 Pour oats onto prepared baking sheet in an even layer. 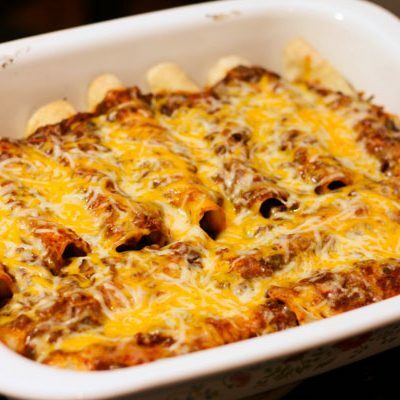 Bake for 30-40 minutes, stirring every 15 minutes to avoid burning. 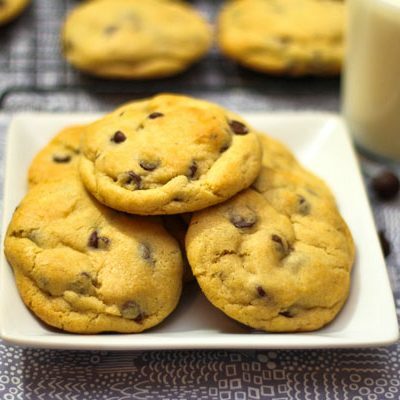 *You can use vanilla extract if you don't have vanilla bean paste. 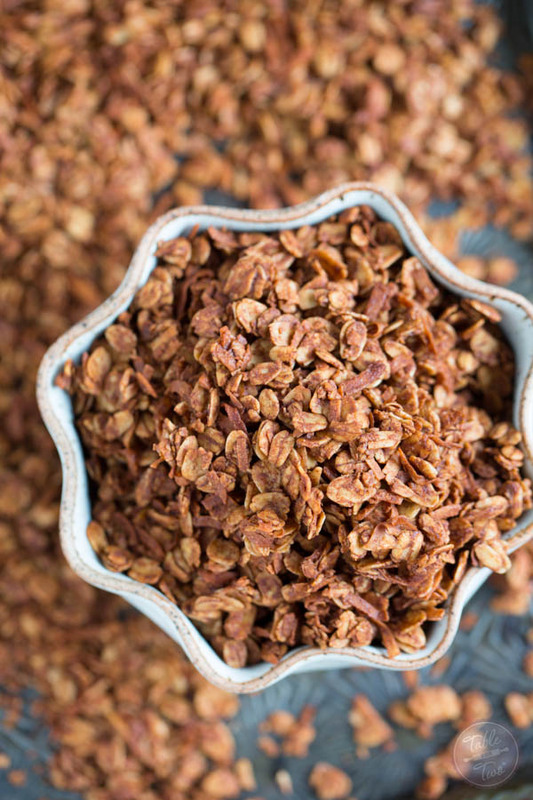 I want to make each of your granolas and have a giant granola fest because yummm! And chocolate for breakfast? Perfect! I love that we’re on the same page today!! Also, I almost always add cocoa powder to my granola. It seriously is the best. Love this! I saw coconut chai black tea at World Market and wondered if it was good! I also love my tea SUPER STRONG, or else it’s just lightly flavored water. Boring. Oh and this granola? It’s my newest favorite breakfast because, well, chocolate. ’nuff said. Pinned! What a way to start the day!! I’m glad you’ve seen the tea-light!! It’s my favorite way to wind down at the end of the day. 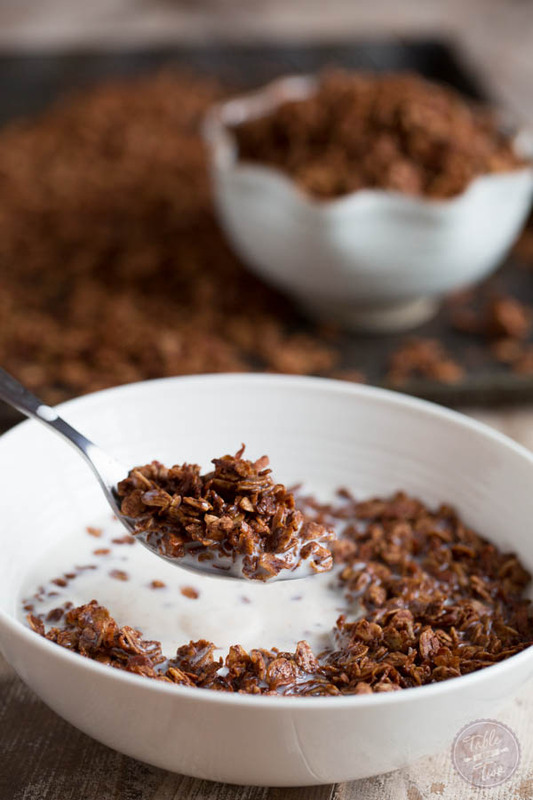 This granola looks like the perfect way to start the day! I will never tire of the combo of chocolate and coconut. Best breakfast or snack ever! Oh yah, loving the chocolate granola! I am just now starting to get on the tea bandwagon! And I would gladly sit and sip a cup while devouring this granola!! I’m loving this granola – Mmmm!! looks SO GOOD!!! And i have 10 types of tea in my cupboard. I drink it all day long- it has totally replaced coffee for me. I love strong tea and strong coffee like you. 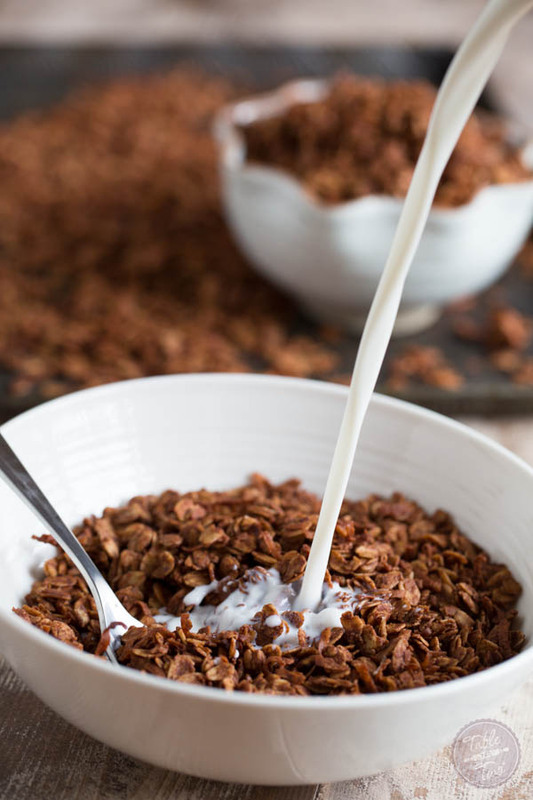 As for the granola, I would snack on this all day long! How fun! 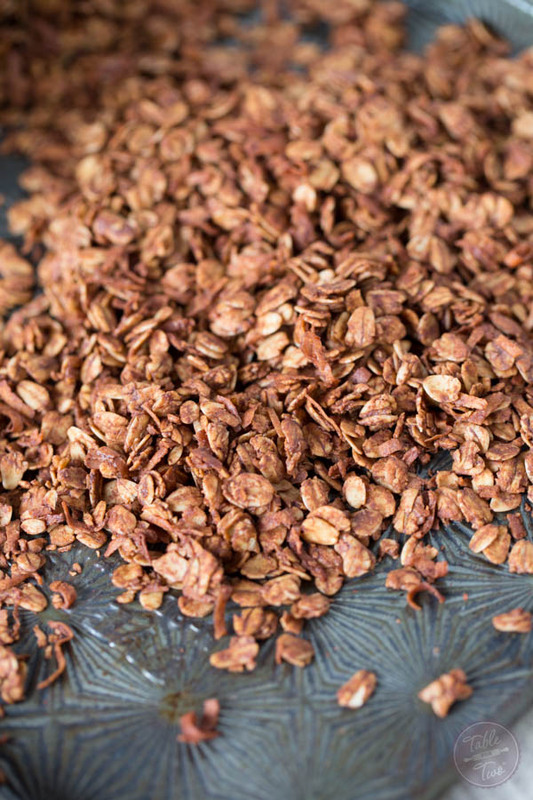 Making your own chocolate granola. Totally love the combo over greek yogurt. Speaking of tea, I use not liking it either; other than bubble tea. But I just fell in love with black tea this past year. 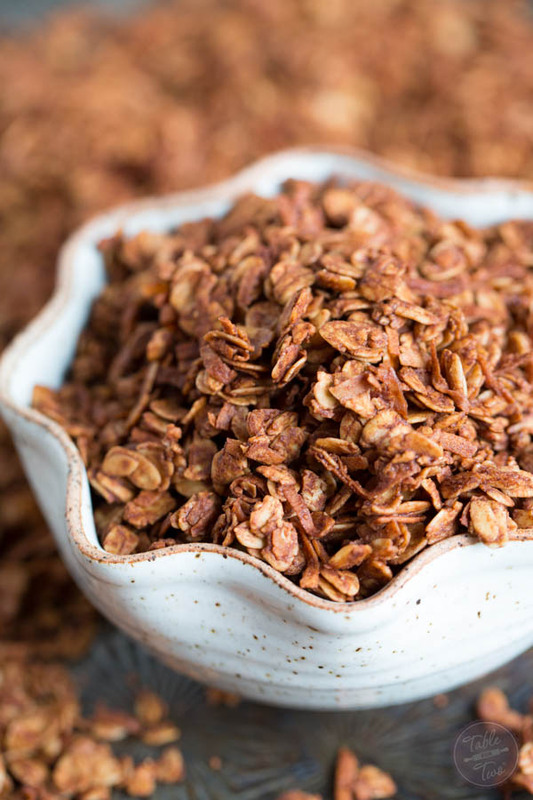 I love homemade granola, I would absolutely inhale this! Chocolate for breakfast = SO MUCH YES. Glad you jumped in the tea boat – if you’re feeling fancy do it the Dutch way: Real, fresh mint leaves in hot water. Steep and viola! What a lovely breakfast! Throw in some sliced banana and I’d be in heaven! I want to start my day with a bowl of your granola! I could eat this all day!!! I’m so glad you’re enjoying it so much! My parents are from HK so they grew up with many British influences. I LOVE tea with milk! And dipping biscuits in them!